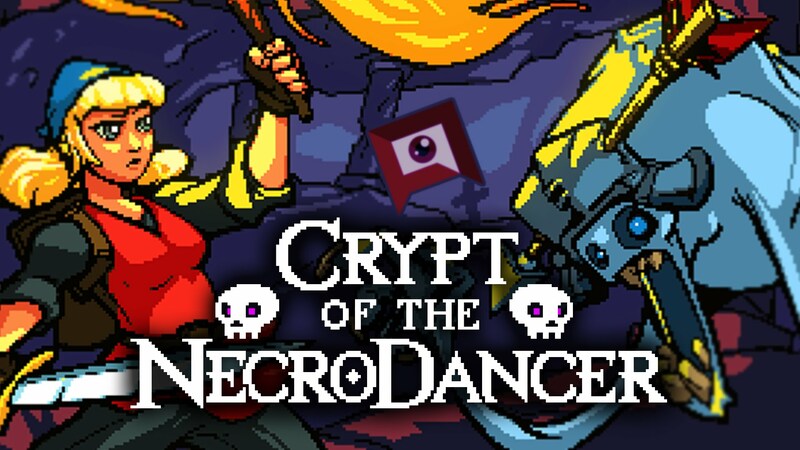 This month, the Game Club played the unique rhythm based rogue-like Crypt of the Necrodancer. In the interest of full disclosure, it was difficult for me personally to stay completely objective on this game. Having worked on a similar game called Soul Fjord that was released on OUYA about the same time as Crypt, playing this game brought back a lot of memories of things we tried and either stuck with or ditched during the development of Soul Fjord. 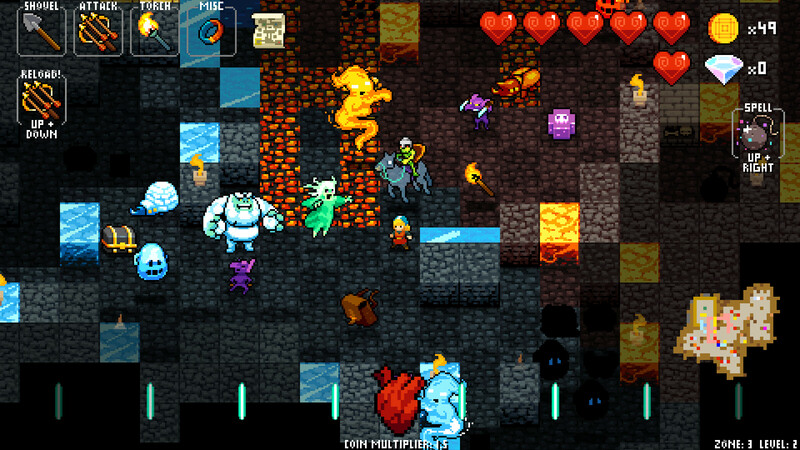 That being said, I tried to put my personal feelings aside as much as possible, and not let them effect my opinion of Crypt of the Necrodancer. We found Crypt of the Necrodancer to be a game better than the sum of its parts – take away any of those parts and it would be just an average game, but they all come together to make for a highly entertaining experience. The game relies on a rhythm mechanic to drive the action, from player movement to enemy movement and attack patterns, everything is driven by and tied to the beat of the music. 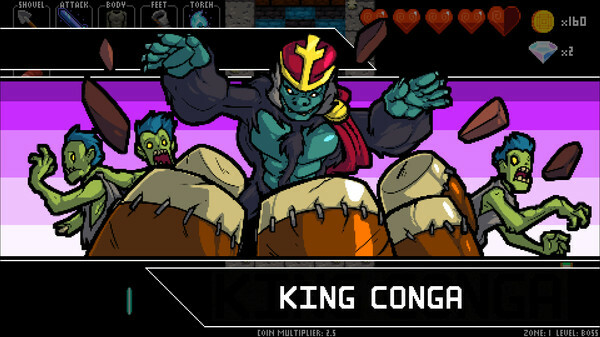 Thankfully, the soundtrack is excellent and doesn’t get grating or repetitive on the multiple playthroughs required to progress deeper into the Crypt – learning the songs and their respective beats was how some of us kept the beat while playing. There are many UI elements and graphical cues to help you keep the beat while playing, but a lot of us found the action to be so fast that we didn’t pay much attention to them. The rhythm aspect tends to put you into a zen-like state, similar to a DDR game where you tend to lose focus on what is happening on screen and let your muscles and reflexes take over. We thought they made a really great choice in having player and enemy movement be grid-based to help you keep to the beat and learn the on-beat patterns and tells of the enemies, which is a crucial element to any good rogue-like. The levels are all procedurally generated, but the algorithm they built made them feel like designed levels with challenging layouts that both encourage exploration and force the player to think about the risk involved in doing so. All of this while making sure everything is able to move on the beat and stay fun and frantic is an impressive feat. We also really enjoyed the boss fights that were unique twists on some classic boss tropes with their own soundtracks and wonderfully punny names. The game doesn’t rely on high-res, realistic graphics to sell itself, but at the same time it has very cohesive art direction and the pixellated retro style graphics match the arcade quality of the gameplay very well. We did however find the UI to be a little overly busy, and with the impetus to keep moving to the beat we didn’t feel like there was a lot of time to analyze your equipped items/spells and put them to good use. The default control scheme seems built around the idea of playing with a dance pad and feels a bit clunky with a controller or keyboard. We appreciated that the game lets you fully customize the controls, but would have liked it better if the menu system in the game used standard controls and wasn’t tied to the game’s controls, which made navigating menus a lot more challenging than it needed to be. It also seemed like the in-game UI didn’t always change to reflect the control customizations, but there appeared to be some fiddling you could do in the menus to fix that. The game has a dual-currency system typical of a lot of modern rogue-likes and free-to-play games, and we felt it worked well to encourage strategies both before and during your run. Gold coins can be found mostly by defeating enemies and spent in your run at the singing shop keeper (one of our favorite characters in the game). There is also a coin multiplier that increases as you defeat enemies while both keeping your movement on the beat and avoiding getting hit by enemies. Diamonds can also be found during your run, and are spent in the game’s lobby to unlock extra items, training rooms that let you practice against bosses and enemies, and lore challenges that force you to put the skills you’ve learned to use to solve ever more challenging puzzles. There are other playable characters with different abilities and attributes that the player can unlock and use to play through the game for a completely different experience from the default PC. The Bard was the one we used the most because his movement isn’t locked to the beat – we found him useful for learning the levels and new enemy patterns, but having a character that breaks the main system the game is based on made the game a bit less interesting. Some of us found after playing through the whole game with the Bard to unlock everything, then going back and playing through again with the main character was less satisfying and challenging. We all really enjoyed the game, but it didn’t inspire much critical thought for the group. It is so unique though that we couldn’t recommend too many changes, but do recommend that you try it for yourself and see if you can dance your way to riches. Next month we’ll be playing Beginner’s Guide and hope you’ll join us in the discussion.